More than 4 cups of berries make this pie extra juicy. Be sure to let it cool completely before you slice it. And dont forget the vanilla ice cream! The recipe comes from Covered Bridge Farm in Forest Lake, Minnesota. Meanwhile, prepare Pastry for Double-Crust Pie. Divide pastry in half. On a lightly floured surface, roll one dough portion from center to edge into a 12-inch circle. Wrap pastry circle around rolling pin; unroll into a 9-inch pie plate. Transfer fruit mixture to the pastry-lined pie plate. Trim pastry even with edge of pie plate. Roll the remaining pastry portion into a 12-inch circle. Cut slits in pastry to allow steam to escape. Place pastry on filling; trim to 1/2 inch beyond edge of pie plate. Fold top pastry edge under bottom pastry. Crimp edge as desired. 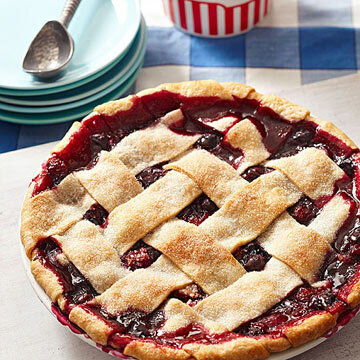 (Or top pie with lattice strips.) If you like, brush top pastry with milk and sprinkle with additional sugar. Bake in a 400 degrees oven for 25 minutes (or 50 minutes for frozen fruit, cover pie with foil for the first 25 minutes). Reduce heat to 350 degree F. Bake pie for 25 to 30 minutes more or until filling is bubbly and pastry is golden. Cool on a wire rack. Prepare dough. Wrap in plastic wrap or place in plastic bag; seal. Refrigerate up to 24 hours. Allow to come to room temperature before rolling out for pie. Stir together all-purpose flour and salt. Using a pastry blender, cut in shortening until pieces are pea size. Sprinkle 1 tablespoon cold water over part of the mixture; gently toss with a fork. Push moistened dough to the side of the bowl. Repeat, using 1 tablespoon cold water at a time, until all the dough is moistened. This is the recipe that I always use. It's a big hit for everyone. I substitute Splenda for the sugar. It's wonderful.